Quilt Market was awesome, especially Schoolhouse where you get your first sneak peaks at the latest fabrics, tools, threads, books, and notions. It was so awesome, it’s taken me three 1/2 posts so far just to tell you about it. Post One covers new fabric lines from Moda; Judy Neimeyer and Timeless Treasures; Elizabeth Hartman and Robert Kaufman; and Ann Lauer and Roseann Cook for Benartex. Post Two covers Carol Hopkin’s new book, Helen Stubbings’ English paper piecing, Cotton & Steel’s new threads, Wonderfil threads, and Tula Pink’s two new fabric lines. Post three covers Quilters Creative Touch; new fabric lines from Anna Marie Horner for Free Spirit, Tammy Silvers for Island Batik, and Edyta Sitar for Andover Fabrics; Helen Pridemore’s new book on fabric panels, and Westalee Rulers for domestic ruler work. Post three and a half <grin> covers three creative quilters and their new books from C & T Publishing: Allie Aller, Katie Pasquini Masopust, and Jean Wells. While I was admiring Allie, Katie, and Jean’s artistry, Scott was learning about the latest fabrics from Alison Glass for Andover Fabrics: Chroma, Diving Board, and Adorn. Alison’s Diving Board collection does not disappoint, with its wonderfully bright happy prints. Chroma (a Handcrafted collection) provides a perfect complement to Diving Board. Alison also offers Adorn, a collection of double gauze, lawn, and linen that’s wonderfully ready for sewing up into beautiful garments. As you know I just adore Alison’s fabrics. I’ve used them in several projects including one from my book, and I even participated in a charm square exchange to acquire more! It was hard to send Scott to her Schoolhouse instead of me, but I did stop by her booth later so that made up for it. Scott then learned all about Tucker University and the Studio 180 Design patterns and tools. With these tools you can easily create Square in Square, Shaded Four Patch, Diamond Recs, Hunters Star, Lemoyne Star, and other blocks easily and accurately. Scott and I were both running out of steam after such a long day at Schoolhouse, but I managed to fit in one last session—Lucky Charm Quilts, a book written by Moda All Stars. Hosted by Ms. Martingale of the Lucky Charm School, the session was light and funny, with each author “charmingly” parading her quilt (created from charm squares) down the aisle, escorted by Prince and Princess Charming <grin>. After Schoolhouse, Scott and I attended Sample Spree. Here, vendors sell a sampling of their products at wholesale prices. The atmosphere was exciting and highly charged, with everyone lining up for the signal to go. The only way to do Sample Spree is with a plan, so I’d reviewed the list of participating vendors ahead of time to plot my strategy. I decided that my highest priority was threads, so I headed first to Aurifil where I picked up four collections of the wonderful 50 wt quilting threads. Next I darted to Wonderfil where I picked up several 100 wt (for applique) and 50 wt (for quilting) collections. I’d recently won a Wonderfil 100 wt collection in an online giveaway and I love how they look so I wanted more. Scott was impressed with Wonderfil’s Schoolhouse so I decided to give their 50 wt threads a try as well. By this time I was threaded out, but I just couldn’t resist picking up one of the new Cotton & Steele thread collections. They are so stinkin’ cute! Can’t wait to see how they quilt up. Anyone who’s seen my stash knows I don’t need fabric, but I found a few solids from Robert Kaufman and Riley Blake, and some fun prints from Me & You for Hoffman Fabrics. I also snagged some batik scarves and a cute little organizer from Yazzi. By the end of that first day at Quilt Market, I can honestly say I was pretty exhausted. And I had yet to step on the Market floor! In the coming weeks, I’ll show you what the Market itself is like, at least from a pattern designer’s point of view. I hope you’ve enjoyed my Quilt Market coverage so far! While you're here, jump over to Wednesday Wait Loss and link up your works in progress. I'd love to see what you're working on! Here in America this is Memorial weekend when we honor those who protect our country. I’m off to see the Indy 500, something I enjoy every year. Even if you don’t live in the USA, I wish everyone a wonderful weekend with friends and family. See you next week! Tell me…what would you have looked for at sample spree? Scott and I are back from Quilt Market and I'm pretty sure our brains are on overload. I apologize that my Market posts have faded away after such a good start, but frankly after catching a bad cold at Market I’m oh so glad that I got anything done! In his next Schoolhouse session, Scott went to see the Quilters Creative Touch 4 computer system for long arms while I trotted off to see more fabric. The QCT software pairs with a Surface tablet to provide an easy interface for creating custom computer-guided quilting. Later I learned more about the system on the show floor and I even programmed it to quilt my name! Meanwhile, I listened as Anna Maria Horner unveiled her new fabric line from Free Spirit Fabrics, Floral Retrospective. Here’s her pattern, Traveling Blooms, which will be offered as a kit. I love her fresh and funky take on florals and how well they play together. Meanwhile, I attended an Island Batik session with designer Tammy Silvers. Despite the fact that she had temporarily misplaced her lecture materials, Tammy gave a lively talk on creating faux curves in your blocks. Here are some of her quilts, featuring her new Batiks Go Retro line. As you know, I’m an Island Batik Ambassador and I simply adore their batiks! Here I am standing in front of their booth. Later this week, I’ll show you the entire booth. If you love batiks as I do, you won’t want to miss the luscious new colors! Edyta Sitar @ Laundry Basket Quilts presented her new fabric line Blue Sky (from Andover) in the next Schoolhouse session. Coordinating with her collection, Edyta is releasing a new book, Patches of Blue and an adorable BOM called Winter Village. Edyta also showed us her new Quilters Canvas, a linen colored fabric preprinted with applique placement lines that, when combined with her Silhouettes prefused appliques, make it fast and easy to achieve the look of Edyta’s quilts. Edyta was so lovely and gracious when Sherry's Peeps and I stopped by her booth the next day. She's as warm and beautiful as her quilts are! Next was the Westalee Design Schoolhouse session. Westalee has designed a set of rulers you can use on your domestic machine to perform ruler work quilting. I was so impressed, I bought some rulers later when I stopped by their booth! Can’t wait to try them out on my home machine. Tomorrow is Wednesday Wait Loss so be sure to come back and link up your wips! I've also got a more lot to share about my trip to Market, including the last of the Schoolhouse sessions, so it'll be a busy week! I hope you've enjoyed what I've been able to bring you so far. Thanks for stopping by! tell me..do you follow particular fabric designers and look for their fabrics in quilt stores? 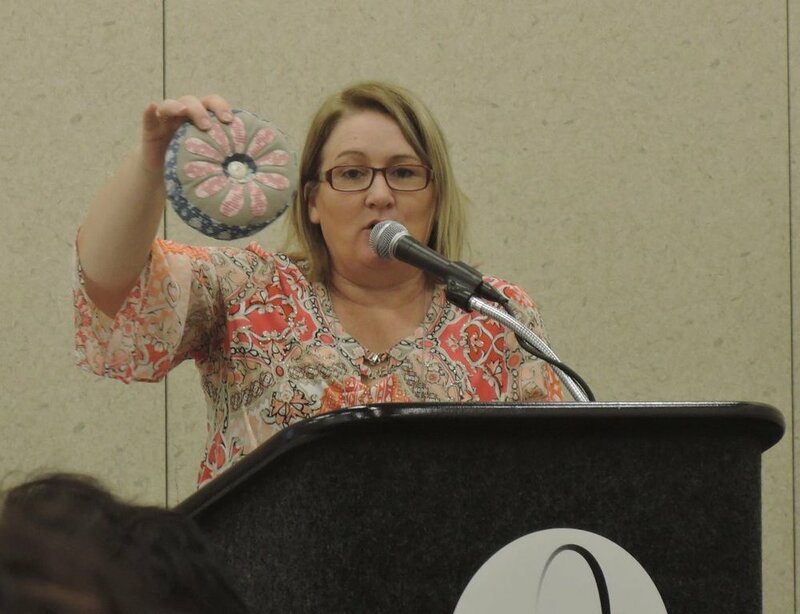 So much happened at Quilt Market 2017 in St. Louis during Day 1 that it took two Fultons to cover it all. The first Schoolhouse session I saw on Friday was hosted by Martingale, featuring Carol Hopkins. Along with Linda Koenig, Carol co-authored 4” x 5” Quilt Book Anthology, published just last March. This book’s history starts with a group of friends challenging each other to design and sew unique 4" x 5" blocks. Most are pieced blocks, some are paper-pieced and some are appliqué. While working on the book, Carol realized that it would be difficult to recreate the group's blocks since they had been made using several different reproduction fabric collections. So Carol worked with Judie Rothermel and Marcus Fabrics to create a unique fabric line filled with red, pink, blue, black and cream reproductions. With 182 block patterns in the book, the possibilities are endless. Martingale offers an online gallery of the quilts each group member created, so you'll have plenty of inspiration for creating your own unique 4" x 5" block quilt. This book is really exciting and reminds me of the Dear Jane quilt phenomenon. Sadly, Linda Koenig passed away last October, although a collection of her quilts is currently on display until July 22 at the Quilters’ Hall of Fame in Marion, Indiana. In my second Schoolhouse session, Helen Stubbings [above] from Tasmania-based Hugs ‘n’ Kisses came all the way to St. Louis to show everyone an easier way to English paper-piece using her unique line of applique paper. Simply iron it on, glue back the edges and stitch your EPP pieces together. After washing, the paper softens into natural fibers and you can't tell that you've left it in. Her product can be used with applique as well--iron the templates onto the back of your fabric, glue under the edges, and machine applique them to the background. Helen's product is also great for foundation paper piecing, needle-turn applique, and as a stabilizer for machine embroidery. You can load it into your printer and print your templates, or trace your templates manually (since the paper is semi-transparent). Next, I attended the Cotton + Steel Fabrics session where I was treated to a video of their newest fabrics. Perhaps even more exciting, C&S is partnering with Sulky Thread to produce a unique line of 50-weight cotton thread that’s 55% rayon, 45% cotton. In a video, Sulky representatives explained how their Egyptian cotton thread is spun, dyed, then checked for quality. This new thread is two-ply, long staple, Egyptian cotton, dyed in Italy. 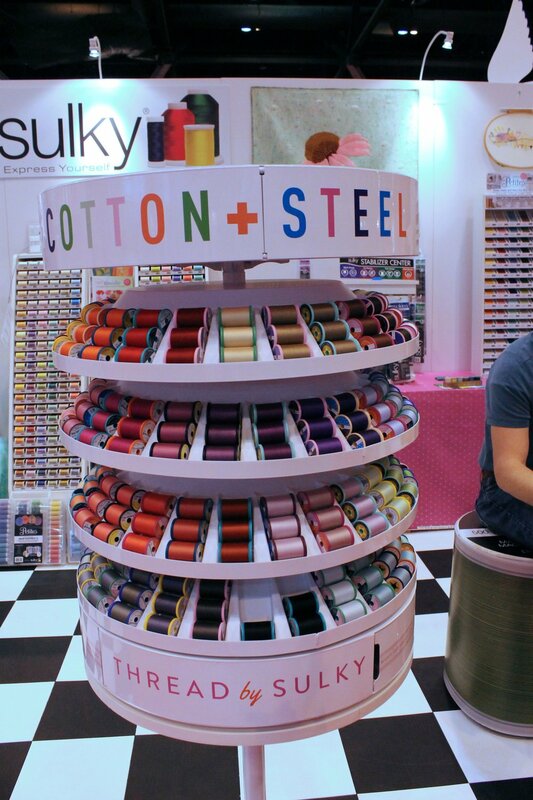 What’s cool and fun about Sulky’s thread collection – besides its quality, of course – is that its spools not only come in a unique variety of colors that compliment Cotton & Steel fabrics, but each spool has its own designer look, with labels on the top and bottom that make for a fun display in your sewing room. Cotton + Steel also showed off its Scout machine embroidery collection. With this embroidery packet, you can design your own original patches that remind me of Girl Scout patches. You can use them to adorn things like purses, totes, and garments, as well as quilts. By combining designs, Scout patches give you an opportunity to create your own personalized patch look. Calgary, Alberta-based WonderFil Specialty Threads unveiled its new, general-purpose thread line. Called Ultima, it promises to be a durable, “bread-and-butter” thread, especially for long-armers and machine quilters who need a less linty thread that doesn’t weave holes in their pocketbooks. Time was, Flamond continued, if you could see your bobbin thread, your tension must be off, especially when you’re using a domestic machine. On a long-arm frame, however, when you can see that nub of thread and you take it off your frame, the quilt relaxes, and the stitch pulls into the middle layer as it should. Ultima is designed, she said, to behave more like this. Joanne added that, with the longer staple, you typically get less lint. But Andrew actually pointed out, each fiber is actually not that long – just over an inch. Spun Egyptian cotton, he said, is actually very linty. So it has to be treated in one of two ways. One involves gassing, which burns off the surface lint. The other involves a chemical bath that acts as a glue. That glue certainly makes the thread less linty, but as Andrew told me, it makes the thread less soft, the same way a hair gel makes your hair feel stiffer. “That’s why we tend not to use that method,” he said. WonderFil prefers a two-stage gassing method, even though it’s costlier than the chemical bath. That’s what’s happening in threads, gasses, and glues this week. Now back to Jennifer. My next session was with Tula Pink, which introduced her latest fabric line, “Spirit Animal” for Free Spirit. Tula did address a recent controversy involving her native American motifs, saying she’s pulling ideas from her own history, and exploring who she is as an artist. Her father is native American. Rather than become embroiled in this controversy over her right to include native America images, Tula said she decided to drop one of the motifs from her line. She didn’t want quilters using her fabrics to have to fight her battles for her. The Spirit Animal line comes in three colorways, all of which are designed to be complementary with each other. Her Wayfinder pattern [above], which invokes both flying geese and arrows, will be sold in shops as a kit that includes both the fabrics and the pattern – and this will be the only way to get the pattern (as is usually the case with Tula Pink kits). Tula also showed off some other designers’ products who have incorporated her fabrics into totes, bags, trinket boxes, appliquéd jackets, purses, and embroidered ribbons, along with several more quilts that use her Spirit Animal and Holiday Homies fabric lines. Would you believe there’s a lot more from Quilt Market in St. Louis still ahead? Stay tuned! tell me...what qualities do you look for in the threads you use in your quilting? As always, I really appreciate your comments. Please leave an email address so I can thank you personally! Scott and I spent a very busy day at Quilt Market on Thursday, and I can’t wait to share what I saw! The day opened with a Keynote hosted by Moda, who showcased a new collection of reproduction fabrics based on designs by William Morris. They worked closely with the curator of the Victoria and Albert Museum, which houses an extensive collection. The four quilts onstage fascinated me the most. On the left, you see two traditional quilts. These highlight the collection and its place in history—classic designs that capture nature in an artistic rather than realistic way, and designs that pushed the idea of what could be printed on fabric and used throughout the home. And here’s another original Morris print re-produced in Moda’s new collection, entitled “Acanthus,” based on a wallpaper he created in 1874 [image licensed under Creative Commons]. Scott saw something different in the collection and I’ll let him tell you in his own words. Thank you, Jennifer, and hello, IQ! What I learned from Moda’s presentation of its William Morris collection, has to do with dimension. The printed fabric produced by Morris’ contemporaries in the mid-19th century was ultra-realistic, including a wide variety of bouquet colors lit from one angle and casting shadows. Such a print poses problems for quilters, who are looking for specific colors and for smaller patches of graphics that present a simpler message when “excerpted,” if you will, and scattered throughout a quilt pattern. After the keynote was Schoolhouse. Schoolhouse is optional (you have to pay to attend) but informative and well worth the time. It’s set up in mostly half hour segments throughout the day (towards the end of the day, the segments were shortened to 15 min.) Each half hour, you can choose from 8 to 10 different presentations. The sessions are given by the leaders in the industry, fabric manufacturers, fabric and pattern designers, book publishers and so on. Scott and I divided our agendas so we could cover as many sessions as possible. 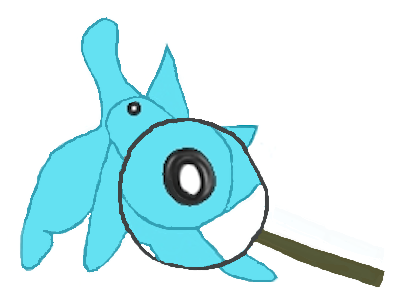 I’ll let him tell you what he saw. First I met Judy and Judel Niemeyer, who produce fabric designs from their studio in Montana, for Timeless Treasures. Their fabulous patterns incorporate tricky looking curves constructed through foundation piecing. To help you create these intricate patterns, they recommend a stitch-and-peel stabilizer, which Judel is showing below. Hanging on the wall to Judel’s right is Diamond Wedding Star, whose pattern is set to be released by Timeless Treasures on June 30. 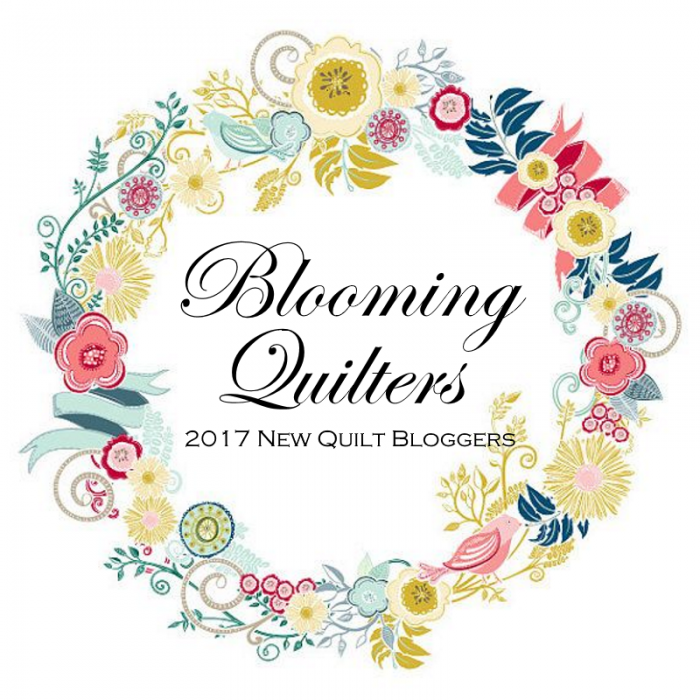 These quilts use the Heirloom Strip set, curated by Quiltworx, plus their Tonga Antique Garage and Cactus Mini collections. Here, Judy is holding up their stunning Fractured Paint Box quilt. This pattern is set for release on June 1. And here’s Fractured Star, set for release on June 8. In my next Schoolhouse session hosted by Robert Kaufman Fabrics, Elizabeth Hartman delighted attendees with her playful and whimsical designs based on animal character blocks. Here’s Elizabeth with Sea Urchins, which shows her signature style. What followed was the saddest sound uttered by a group of people since the revelation that Elvis had left the building. It seemed to sway her, so don’t be surprised if there are beagles or shepherds in Elizabeth Hartman’s future. 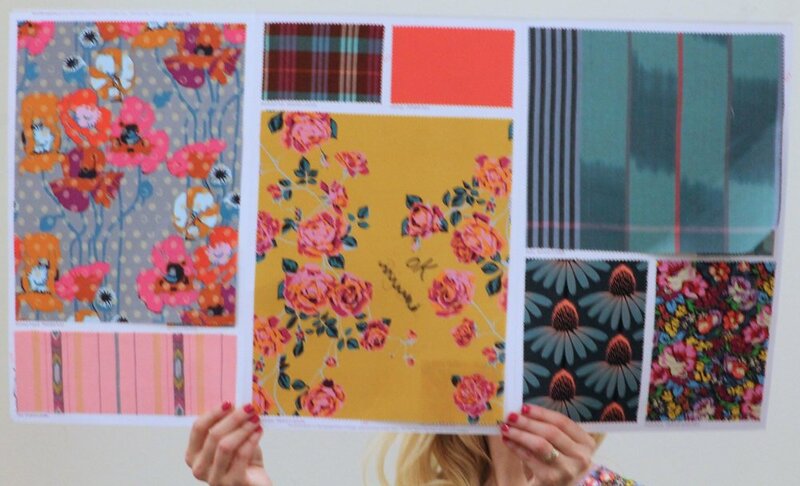 Ann Lauer from Benartex Fabrics [pictured right, above] headed up the next Schoolhouse session and presented quilts based on Benartex’ new line of fabrics blending antiqued, but vibrant, colors with a sunflower print that would brighten Van Gogh’s day. Here’s Morning Melody [above]. In a very different vein, but with the same fabric line, here’s All That Jazz. In Kansas, whose state flower is the sunflower, quilters are going crazy for this fabric, Lauer told attendees. And here's Round the Block, whose sunflowers follow a circuitous path that Vincent would most certainly have enjoyed. Also from Benartex, fabric designer Roseann Cook based her new fabric line, entitled Modern Antiques, on this discovery: this bruised, battered, but beautiful quilt, dated approximately 1870, which she picked up about ten years ago from Robyn Pandolph’s quilt shop in Galveston, Texas, for a hundred bucks. From that inspiration, Roseann conceived this beautiful fabric line, whose prints are not only designed but engineered to help quilters reproduce the look of a genuine antique quilt – albeit without the rips and tears. Here’s Roseann's stunning quilt produced with her pattern that incorporates the Modern Antiques line. It’s called County Fair, named for the Round Top Antiques Fair from which her inspirational antique quilt was found and rescued. Part of what makes this pattern easier to work with than it looks, Roseann told me, is the inclusion of engineered prints, which you can see at the top of her samples. This makes detailed borders as easy as solids. But there’s also this wonderful, cream/ivory background fabric that you’d think is a solid, but that’s actually a very subtle print. That print is picked up in the background of the engineered print. The design of this fabric, she explained to me, is such that the light will pick up subtle shades when you quilt it, thus reproducing this genuine antique look from a fresh, new fabric. By the way, in case you’re wondering, Roseann is a dog person – one of her most successful Benartex lines thus far has been Joey, the Shop Dog. As you know, Benartex donates 10% of its revenue from purchases of this fabric line to help rescue animals. Tell me..what's the first thing you would want to see if you came to Quilt Market?